Buy 1 for $27.66Buy 2 / Save $1.48!Buy 3 / Save $5.53! insomniacs 1,000 years ago discovered the benefits of this plant and its herbal extracts. It was not until the mid 1980s that the active agents were thought to be the volatile oils. However recent research has questioned the volatile oil theory throwing the origin of valerian's sedative principle into mystery once again. Most supportives are made from the dried root and rhizomes since the highest concentrations of calmative and tranquillizing principles are located in these tissues. Mild Sedative to Aid Sleep: Sleep is a complex process and sleep disorders are very poorly understood. The use of a traditional herb such as valerian is a safe method in assisting the natural process without risking addiction or robbing the brain of its natural sleep-wake rhythms. Studies carried out in sleep laboratories have confirmed that the herb exerts a mild sedative effect. The herb appears to act on the brain chemistry. GABA is a brain chemical responsible for relaxation and a feeling of ease. By stimulating the cells that normally respond to GABA, valerian can encourage rest and relaxation without forcing the body into a state of sedation. It is important to appreciate that valerian is an effective herbal sedative but it is not strong enough to combat a high habitual caffeine consumption. In general, 15 to 20 drops of the traditional 65 percent liquid extracts can be taken 2 to 3 times a day. 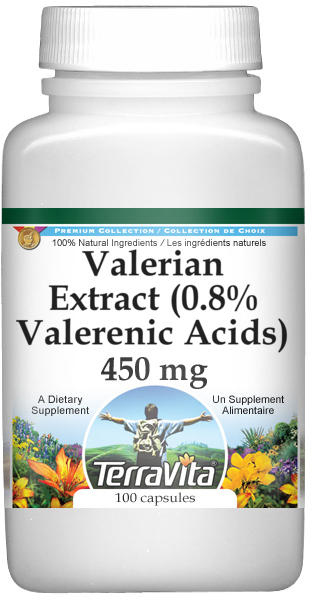 For those requiring a stronger supportive, valerian extracts standardized to contain 0.8 percent valeric acid should be taken as a dose of 150 to 300 mg. For best results take the herb 30 minutes before bed while avoiding caffeine and caffeine-containing food and drink, and alcohol. Toxicity: Valerian taken at the recommended dose is essentially a non-toxic herb. Drug-Herb Interactions: A recent review has found that valerian can increase the effect of barbiturates.